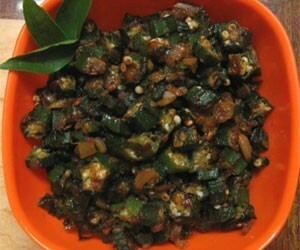 Aloo Bhindi is a common side dish in North India.There are many ways to prepare Aloo bhindi. 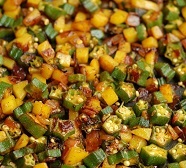 I have added the best and easy recipeof Aloo bhindi. 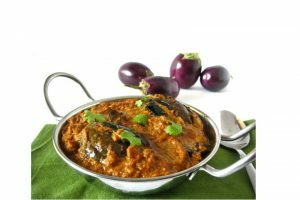 Aloo bhindi can be used as a side dish for chappatis or along with white rice. 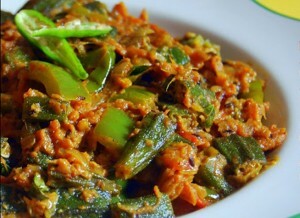 Bhindi is also known as okra or ladies finger.Bhindi/Okra is rich in fibre content. 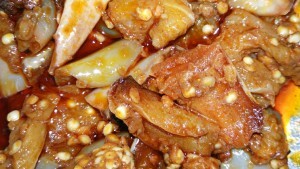 It has known properties of reducing diabetes.A good source of folates. Seems having medicinal value and helps in cure of Asthma, Constipation, Sun stroke, Colon cancer, Obesity, Cholesterol and is rich in vitamin K. Okra benefits skin and hair too. So a good vegetable that needs to be added in daily diet. Add cumin powder, coriander powder, garam masala powder, red chili powder, turmeric powder, asafoetida/hing and saute till it is brown in colour. Add oil if necessary. Add potato and Bhindi in to it and mix properly and saute for 1 to 2 minutes. Add Amchur or dry mango powder and Kasuri methi and saute for a minute.